A delightful marriage of yellow and purple creates this superb arrangement. 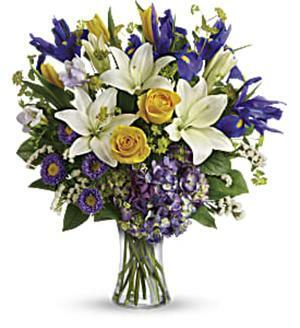 The blue iris adds a dramatic flare to the yellow roses, white lilies, tulips, purple hydrangea and purple asters. This lovely bouquet establishes a bold pop of color and a beautiful vision. Perfect for any occasion! Purple hydrangea, yellow roses, yellow tulips, white asiatic lilies, blue iris, lavender freesia, and lavender matsumoto asters are arranged with white sinuata statice, bupleurum, and lemon leaf. Delivered in a Clear Glass Gathering Vase. Approximately 18 W x 20 1/2 H Flowers and container used subject to availability and season. Some substitutes may be necessary.